One way check valves help keep mud and water out of vent lines. What type of check valve do you use for the vent lines to keep water out? Also, what if anything can I put on the muffler to help with the mud sticking? World of ATVs Comment: Good questions! We like the one way air check valves normally used for aquariums. You can also check with your local dealer for something similar. 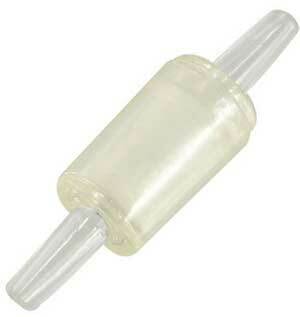 Some of the smaller inline fuel filters can also be used as one way valves. Exhaust systems are hard to keep clean, especially after the mud gets baked on. You can't really spray anything on the exhaust because it will just burn off as soon as things get hot. The best you can do is to keep the exhaust system as slick and clean as possible. If you have a stainless or aluminum muffler, clean and polish it after a ride. Some of the ceramic hi-temp paints that have a slick finish work well on the painted steel type mufflers. The general idea is to maintain as close to a non-stick surface as you can. The rougher the surface, the more mud will stick to it. Hope this helps and thanks for the great questions. If anyone else has any ideas, send 'em in! Comments for ATV Mudding Questions. Thanks for the ATV mudding tip. Thanks for this tip! Always wondered how the check valves worked.